Comments: Charlie Allen, known for his work with Saor Patrol, is a full-rounded musician with a very eclectic background. Recently, he released one of his most ambitious recording efforts to date: Battle of the Kings. This amazing release is not only a piece of music in itself: it actually fits into a much larger scope, and it is a part of a larger set of projects and initiative, touching on many different spheres. Charlie Allen explores a wide variety of industries, ranging from multi-media experience, to film, cinema and many more. For instance, he is attached to the acclaimed Netflix Movie, Outlaw King as well as a wide variety of other projects. One of the most intriguing recent initiatives led by Charlie Allan and Saor Patrol was definitely Duncarron Fort, a historic replica of a medieval village, located in Carron Valley, Scotland. The charming historical recreation site was recently visited by famed Australian movie star Russell Crowe, who also happens to be a personal friend of Charlie Allen as well! The pair have been friends for quite a long time. In fact, they met on the set of one of Russell Crowes most high profile big-budget films: The Gladiator. The successful film, also starring celebrity actors such as Joaquin Phoenix, went on to gain popularity on a global scale. Read the Full Review on Saor Patrol's new release! Write about Battle of Kings! 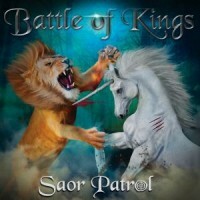 Want to write a review about Saor Patrol's Battle of Kings album? Post your comments in this box to be displayed in our community forums and in our album database! Please make sure you are logged in before proceeding. Please login to write your comments about Battle of Kings.